I'm not a big-time gardener. Most of the things in my yard thrive through my benign neglect. But due to some judicious planting (and a weekly gardening service that's one notch above blow-and-go and a mild Southern California climate), I can step outside and find something, somewhere, in bloom, pretty much year 'round. Right now, it's azaleas and camellias. I love flowers in a house. Or an apartment. Or a dorm room. (Maybe especially in a dorm room, where, typically, there isn't much loveliness.) Even the littlest bit of Nature lifts my spirits and makes me smile. 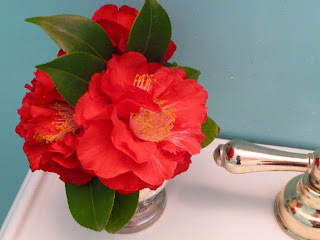 These red camellias are in my powder room on the sink, where they look very handsome against the Tiffany-blue wall. If you have no garden or a tight budget, there are still ways to enjoy flowers. Buy an inexpensive grocery-store bouquet and split the cost (and the blossoms) with a couple of friends. Ask a flower-rich neighbor if he/she will let you cut one blossom a week. Or strike a deal; a blossom a week in exchange for something you can offer. Bring in the mail when the neighbor goes on that yearly vacation, or walk the dog, or...whatever. You get the point. If you live where there are no absolutely no gardens, keep an eye out for empty lots or things poking through cracks in the pavement. Some weeds produce beautiful flowers; we just forget to see them as such. So, for a bit of soul-restoration, try this: Get yourself a junk-shop bud vase, or an old teacup, or even a clean glass bottle. Fill it with water. Plop your flower in it, and put it where you can see it several times a day. Stop. Notice the flower. Breathe. Smile.